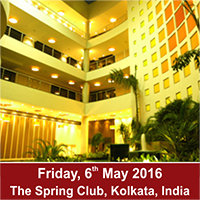 Exim India Shipping Times is pleased to announce 3rd Edition of East Coast Maritime Forum 2016 Concurrent with Eastern Star Awards 2016 scheduled on 6th May 2016 at The Spring Club, Kolkata, India. The Maritime Forum will see some of the top decision makers from the maritime, cargo and logistics industry, besides policy formulators and regulatory authorities, participate in a wide-ranging and stimulating deliberation on the issues pertaining to this region. New paths and innovative strategies will be explored to give a further fillip to the industry and general trade in the region. Kolkata Port, Paradip Port and other Eastern Ports are ideal gateways for cargoes originating from the regions of West Bengal, Odisha, Jharkhand, North East India, and some parts of Andhra Pradesh. Hence, these regions will gain wide prominence in this event. The gala Awards Night will honour and recognise the best companies and individuals who have excelled and made a difference through their distinctive performance and innovative thinking. With the roll of the drums amidst cheers and applause from the leading professionals and stalwarts of the industry, the glittering awards ceremony will truly be a night to remember. Thus, 3rd Edition of East Coast Maritime Forum 2016 Concurrent with Eastern Star Awards 2016 will again affirm the event’s status as the definitive avenue for thought-provoking discussion and recognition of excellence in the sector. So, join us at the Grand event and awards night to honour and celebrate excellence. You can also associate with this eagerly awaited event as a partner. It will be an occasion to cheer, savour and network.